Chinese consumers are shifting their pattern of spending to discretionary items. They are spending less on housing and food, but more on upgrading their lifestyles, on items such as healthcare, travel and entertainment compared to other emerging markets, according to Credit Suisse Research Institute's 7th Emerging Consumer Survey. 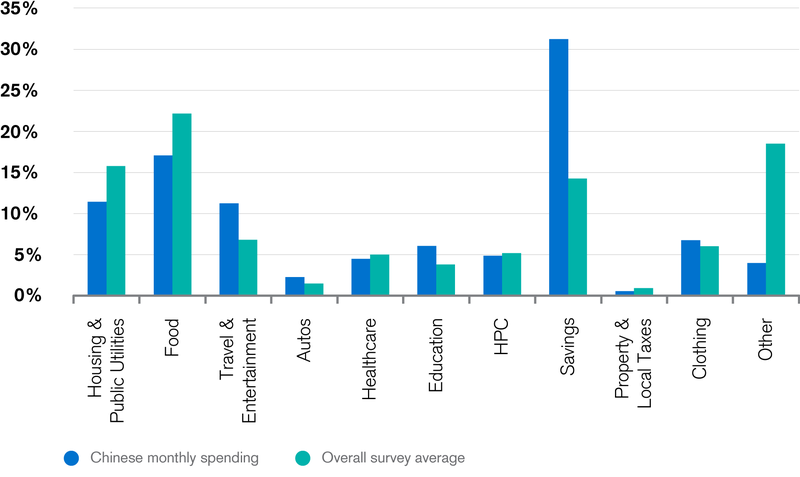 Observing monthly spending by category, the CSRI analysts find that Chinese consumers are spending more on upgrading their lifestyles, on such goods and services as education, cars, property and mobile phones. Growth in spending on large-ticket items continues to outstrip that on more staple items. China has seen a rapid acceleration in travel and entertainment expenses, which now represent 11 percent of the monthly household income, twice the level recorded in 2011. This is higher than any of the countries in the survey. An aging population in emerging markets is set to add pressure on healthcare spending. Emerging markets are projected to age at approximately twice as fast as citizens in developed markets. By 2035, the share of the population aged 65 or older in China is projected to be similar to that in countries such as the UK and the US, resulting in increased demand for healthcare services. The CSRI report projects that China would be facing healthcare costs of USD 2.3 trillion by 2030, up from USD 611 billion in 2015, mirroring the increased spending on healthcare seen in developed markets as their populations have aged. To mitigate this potential and unsustainable healthcare burden, Chinese consumers have started to lead a healthier lifestyle, or intend to do so. Nearly 40 percent of respondents are planning to increase the time spent participating in sports, while almost 80 percent admit they have started to eat more healthily. The need for a healthy and more conscious lifestyle is evident as healthcare spending looks set to grow. Higher longevity and an ageing population are key factors likely to increase the pressure on healthcare expenditure. A more health-conscious consumer should imply that the consumption of unhealthy food will decline. External sources such as Nielsen's Global Health and Ingredient Sentiment Survey (August 2016) suggest that consumers across emerging countries are much more focused on what they eat than consumers in developed markets. For example, almost 40 percent of consumers in the Asia-Pacific (APAC) region follow a low-fat diet (nearly twice the level seen in Europe or North America). 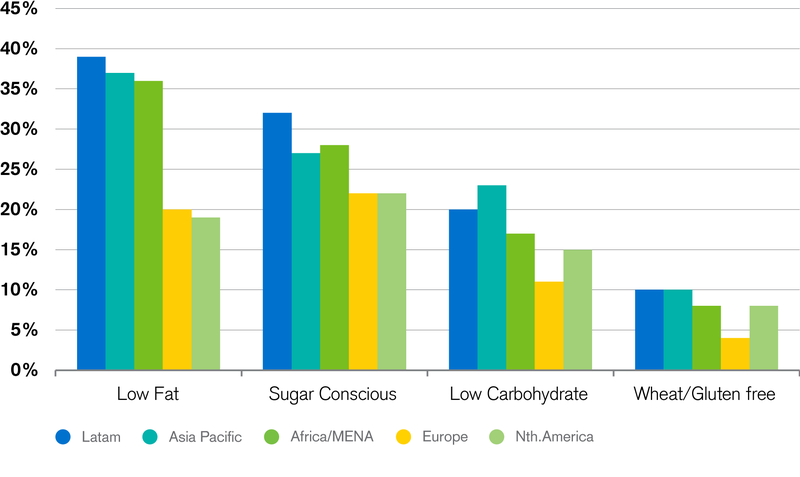 While not as extreme, there is also a higher uptake for low sugar and low-carbohydrate diets across Latin America, Africa and APAC than in Europe or North America. Moreover, consumption of beer, spirits and cigarettes is down year-on-year across most of the countries surveyed. This trend does not appear to be "youth-led" as middle-aged consumers appear to be changing their behavior in parallel with that of the millennials. This shift in behavior is supported both by higher income and the expectation of higher household income in the next 12 months. With the generation born between 1985 and 1995 reaching their 20s–30s, a relatively affluent young group of China's future middle class is being shaped. They are expected to account for 35 percent of China's total consumer spending in the next five years. The Chinese government is focused on expanding the country's sports industry and, as stated above, a large chunk of respondents intend to increase their sport-related activity. The younger generation has the strongest appetite to do so: of the 18–29 age group, 55 percent indicated a desire to spend more time on sports, with just 3 percent indicating the opposite. Among more senior citizens (aged 56+), almost 20 percent want to become more active, with just 2 percent planning to reduce their level of activity. Data collected in the CSRI Emerging Consumer Survey suggests that Chinese consumers are more likely to buy premium or more expensive versions of products than mass-produced goods. Positive purchasing momentum was seen only for expensive items (property, cars and jewelry) and "lifestyle" products (sportswear and fashion). At the other end of the spectrum is the spirits category, which lost momentum quite significantly compared to the previous year. However, given that as many as 30 percent of respondents bought more expensive cognac brands in the last 12 months, the negative momentum is probably driven by cheaper, lower-quality products. One product area where consumer spending intentions are less obviously moving to premium is smartphones. Among the respondents, 92 percent already own smartphones, which is 2 percent and 8 percent higher than in 2015 and 2014 respectively. However, 71 percent of respondents prefer phones that cost less than RMB 2,500. This explains why 52 percent of respondents think they will choose Android versus 24 percent expecting to choose iPhones in the next 12 months. Clearly, domestic smartphone brands are on the rise, driven by their value for money. The transformation of China's economy, with all its challenges and complexities, continues to be truly remarkable. While traditional manufacturing industries battle to survive, the country's new economy industries have proven to be extraordinarily innovative, with many Chinese enterprises establishing themselves as global leaders. To stay ahead of the curve and capitalize on the next major investment themes, gain insights from key experts at the Credit Suisse China Investment Conference.